There's no doubt about Iannis Xenakis (Braila, Romania, 1922 - Paris, France, 2001) is one of the greatest composers in the XXth Century, creator of a large work full of originality and rigor, that make of him one of the references in the last decades for composers all over the world in the last years. Every new CD by Xenakis is an occasion, specially if this CD combines, like in this case, a first compilation on CD, a world premiere recording (Ittidra) and these very excellent performances conducted by the great conductor of contemporany music Johannes Kalitzke. 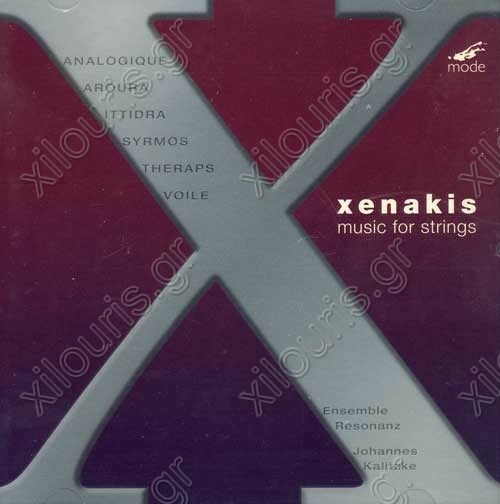 The works taken in this recording represents 37 years in the career of Iannis Xenakis, from Syrmos (1959) to Ittidra (2006), a period that means quite all the life of Xenakis as composer, and that shows how he thought and created in the chamber music field, that one in which Xenakis used to experiment very much for his largest works.